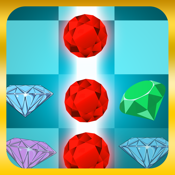 Jewel Crush is the simplest game there is! Draw lines between precious gems to form long strings. The more jewels you string together, the more points. For even bigger bonuses, connect Jewels to form squares! - Four awesome booster powerups: Blow up candy with bombs, unleash lightning, and much more!